Property Size 602 sq. ft. Sit on your deck and watch the river flow down to the lake from this riverside cabin. Cabin 107 &108 are a duplex and work well when you rent both units at once in order to have family and/or friends located side-by-side. They are on the Flying Arrow Resort grounds and are near cabins 101-112, Minnow, and Fawn as well, which is good for family reunions and other gatherings. This cabin has an awesome view of the river and mountains and a deck where you can sit and enjoy the view and relax. It is close to many activities including miniature golf, restaurants, go carts and more! It is a great rental for a small family looking to get away and enjoy the wilderness. 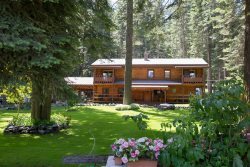 Explore one of the Seven Wonders of Oregon with your family and friends in this nice vacation rental!